Who would ever think that Donita Rose Cavett, that formerly shy and quiet girl from Angeles City, Pampanga, would end up as one of the most sought after personalities today? Ever since she joined MTV Asia in Singapore in 1998, veejay Donita has become such a captivating sight on TV and has graced the covers of dozens of local and international magazines, including TIME magazine. Prior to her MTV stint, lovely Donita had already become among the "stars-to-watch" in the Philippine entertainment scene. Back then, she was part of a weekly variety show, a sitcom and had appeared in several movies. Call it clichÃ©, but her discovery in showbusiness was purely accidental. Way back in December 1988, Donita, together with her whole family and some cousins, went to Manila to shop and to visit her mom's dentist. This dentist noticed that they were getting bored and suggested that they watch the taping of GMA 7's noontime show, Lunch Date. While watching, a cameraman began to focus on them. Later, the cameraman suggested that they come back in the afternoon to watch "That's Entertainment", which they did, because the experience proved to be enjoyable. While watching, one of the mainstays of the show suddenly began to serenade her and afterward, asked if she would want to audition for a part on the show. She looked to her mom for approval who in return gave her the thumbs up sign. With this, Donita immediately said yes - not knowing that it was to be the start of something big in her life. In March of 1989, Donita auditioned for "That's Entertainment", passed, and was included in the Friday edition of the show. Two months later, she got her first movie offer to star as Gabby Concepcion's leading lady in Regal Film's action flick "Sargento Gabo". However, another film offer came rolling in shortly thereafter which ended up hitting the theaters first. This comedy film was entitled "Katabi Ko'y Mamaw" wherein she played the title role of a ghost with Carding of the Reycards. Due to the fact though that she could only speak English and her mother's native tongue (Pangasinense) and not Tagalog (the Philippines' main dialect), Donita somehow was still able to captivate Filipino audiences from all levels with her charm and witty talent. By taking advantage of this newfound novelty, this young girl was able to break down the language barrier when she was cast as "Barbie Doll" in a brand new sitcom called "Ober Da Bakod". This show highlighted the comic irony between the lifestyles of the rich and the poor and went on to become one of the highest rated sitcoms on Philippine television lasting for almost six years. Donita thus proved she was far more than just another pretty face. To date, she has 28 other movie projects under her belt, including the internationally released, "Legacy", with popular "Baywatch" TV star and producer, David Hasselhoff. The biggest break in her career though was when MTV Asia got her to be one of the network's video jocks. It was here that Donita finally learned to come out of her cocoon and emerge as a very confident person, able to face anybody, anywhere. To this adventurous and spunky lady, the best part of the job is being paid to do the things she loves to do most: talk about music, have fun, entertain, inspire others, and travel to many exotic places, learning new languages, trying native food and meeting new people.When asked about her share of exciting moments as a veejay, she recalled that one time, she was asked to host the MTV/CCTV Mandarin Music Honors which was seen by about ninety million households in China. She was thankful that she was given the artistic freedom to play with the script, making it possible for her to come up with her own Mandarin terms. Surprisingly, this was the first time that she had never gotten even the slightest bit nervous during the event. She claims that it was the most exciting thing she had done in front of such a large audience. In another event, she brought her brother Paul along with her and together, they enjoyed their very first skydiving jump. To date, what she considers the most prestigious events in her career are: when she landed in the cover of TIME magazine in December 1999, when she was introduced to Her Majesty Queen Elizabeth at an invitational polo match in England where she was invited to be the muse, when she hosted the Ricky Martin show in Singapore twice, when she interviewed Bon Jovi in Tokyo for MTV Asia and, recently, when she herself appeared twice on CNN, the first being a 30 minute interview on CNN Talk Asia, hosted by Dalton Tanonaka, and just recently, a five minute chat portion on CNN News with Veronica Pedrosa. Back in the Philippines, Donita has emerged as one of the top endorsers in the country. Among her most recent commercials are the Globe Telecom's GenTXT Club, Lux Super Rich Shampoo, Betadine Feminine Wash and Pepsi. Donita has also graced the covers of other very reputable and widely read magazines such as MEGA, ELLE, CLEO, FEMALE, FHM, HEALTH TODAY, PEOPLE ASIA, and PREVIEW, among a dozen others. In fact, this beauty is the very first Filipina to be featured on the cover of COSMOPOLITAN and SEVENTEEN. Despite her success, Donita manages to keep her feet on the ground. She stays focused because she knows that she wouldn't have attained her achievements without God's help. She also owes all these to her parents, who have worked hard to build a strong foundation in her. Donita comes from what she describes as a perfect home. Her parents are very strong Christians who have high standards and strong moral values. Her dad is a retired civil engineer formerly in the U.S. Airforce, while her mom is an elementary school teacher for military dependents. Though they are all now physically apart, they all remain very close and loving to each other. Donita has very fond memories of her childhood. Back then, she enjoyed a closely-knit relationship with her extended family in Angeles City where they lived in a big compound that housed many of her cousins. She recalls having dinner together with relatives every night and it did seem like they were having a feast each day of the week. After dinner, she'd play patintero (line tag) or hide-and-seek with her cousins. They also loved to play house, during which she always insisted that she be the princess or the mermaid (if they went swimming) even if the role was uncalled for! Since childhood, Donita had first aspired to become an astronaut, a marine biologist and even a computer scientist. She was only able to somewhat fulfill her second dream by taking up scuba diving but has yet to experience the latter. "I may not have accomplished many of my childhood dreams..." as she puts it, "but I have definitely been blessed with more than I could have ever imagined! Not only do I have a passion for the job and a love for the people I work with but I also can look back on my life and can say that I've lived it to the fullest and to the best of my ability!" Donita is thankful that God answered a prayer she uttered years ago. 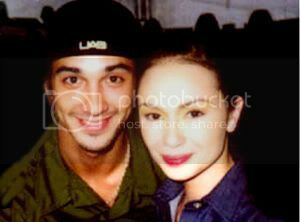 Three days before she got discovered by German Moreno (a.k.a. Kuya Germs) in "That's Entertainment", she prayed, "God, please make something happen in my life. I want to know what my destiny is and I hope that I would fall into it soon." Believe it or not, that is how it all started for her and with only a very simple prayer. "I didn't know God that well then, but in my heart, I had always believed that if you always tried to honor Him, seek Him and obey Him, that God would make all the best things He has planned for you happen in His own time. Even if I have made many mistakes in the past and still do now, I would always try to rectify the problem and get back on track. I don't know how else to put it but I truly believed it back then and still do now. It seems to have worked for me for many, many years now!!!" "I also firmly believe that God made everybody for a reasonâ€¦ for a purposeâ€¦ and everyone does have a purpose in life, you just have to ask for it to be fulfilled. Your job is to make sure that you strive to do your best to reach your goals. Remember, you don't have to be the smartest person in the world or be the greatest singer. Look at me, I'm not that great a singerâ€¦okay, I'm not a singer at allâ€¦but the point is, you still can go far." As to her future plans, Donita sometimes dreams of going back to the United States to live with her family, whom she misses so much. However she feels that at this point, her call is to stay in Asia. She believes that God has put her here for a reason: "To make an impact in this generation - the youth of today - and show them that they can make the most of who they are, be all they can be without having to compromise with worldly standards." Nobody can tell what the future holds, but Donita says she is not fearful of whatever tomorrow may bring. "If I know I'm doing the best I can in the right ways, then no matter what the circumstances may be, I know that I'll be fine because it's all in His hands. He has promised to never forsake me so why should I bother worrying?." Serious thoughts, so simply stated. All these from a girl who went to the dentist's clinic many years ago and wound up bringing us the cheerful smile we've come to love on the cover of the magazines we read, the billboards we see on the road and the television sets we turn on everyday. Edited by zhuxiaoxing, 07 March 2004 - 12:06 PM. Edited by angelvan, 10 March 2004 - 04:50 AM. She's also my fav! And she kinda looked-a-like of Audrey Hepburn, especially if the pic b&w !